Running CP/M on the Commodore 64! 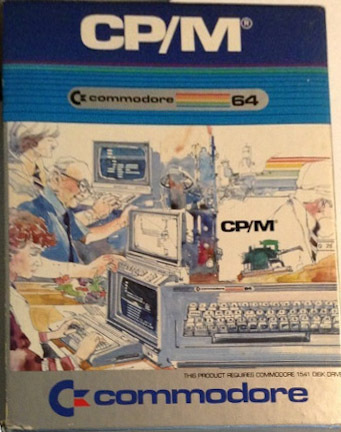 Back in 1983 there was this great idea of expanding the Commodore 64 with the then popular (but declining) base of serious business software from the CP/M side of the world by creating a cartridge with a z80 processor inside, and a special port of the CP/M operating system that would take over the C64 letting you run real programs like Fortran, Cobol and the far better (and updated) Microsoft Basic v5! However as always the major failing of CP/M was the massively different and incompatible diskettes of every platform. The Commodore 64, lacking in RS-232 ports, and it’s incredibly incompatible 1541 drive rendered it nearly impossible for the average home user to transfer any programs in the specially formatted CP/M diskettes for the cartridge. Not being able to read a standard 1541 diskette would prove to be it’s undoing. While messing around in Vice, I saw that this cartridge is emulated now! A quick search led me to zimmers.net where I was able to then locate the needed cpm.d64.gz, and I was booted up into CP/M and of course that hit the first snag which is of course, where is the software? 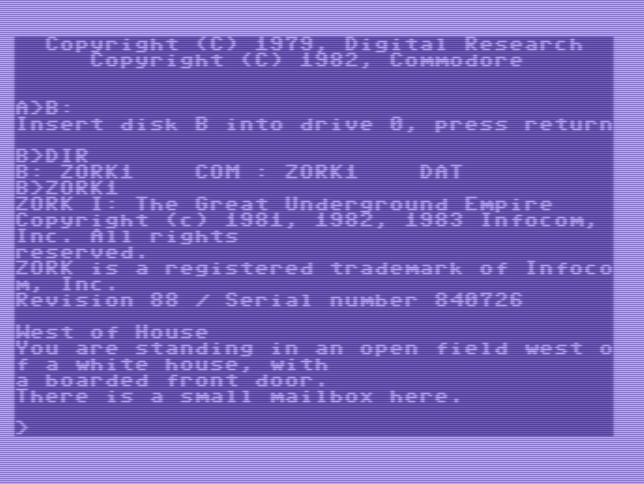 Well another search brought me to the package ‘ctools‘ which I quickly built on the Linux subsystem for Windows (I had to add -fpermissive to get it compile..), and now I could take that CP/M diskette delete the contents, and for the heck of it insert in Zork.. Of course where to find Zork along with other CP/M software? 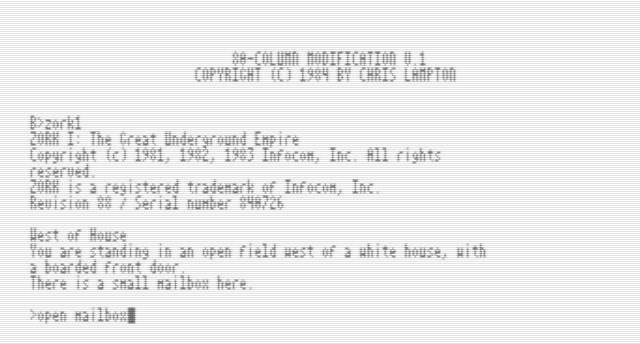 The zip zork123_80.zip can be located on retroarchive.org, even fun things like Microsoft BASIC v5.21 (Interpreter), along with the manual. CP/M only recognized a single drive, so you have to swap diskettes (Such a typical Commodore 64 experience), and here we go! Naturally the Commodore 64’s 40 column mode is… terrible. However even back in 1984, a fine program aptly called soft80.com sets up the Commodore 64 in high resolution graphics mode, and emulates an 80 column mode. Even better, the magic for the most part happens on the 6502 side, meaning it doesn’t take away from the precious memory on the CP/M side. Its worth noting that although Infocom games are dreadfully slow on the Commodore 64, playing under CP/M is also dreadfully slow, taking some 10-15 seconds to complete a command. At least under emulation there is the warp mode. And what took an hour to put together would have been months no doubt in the 1980’s ending in the CP/M cartridge going into a drawer to never be seen again. Author neozeedPosted on July 27, 2018 July 28, 2018 Categories 6502, 8080, Commodore, CP/M, Digital Research10 Comments on Running CP/M on the Commodore 64! 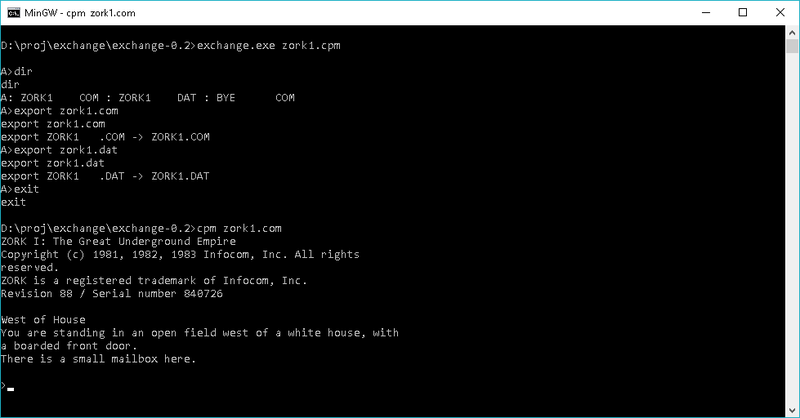 While on the road, I stumbled onto a link that referred to this program called Exchange, which is a decapitated ‘port’ of CP/M that simply allows you to read and write CP/M disk images. While on the surface it may not seem much, but the fact it actually uses the 68000 kernel from CP/M seemed really interesting to me. With minor fighting I had it running on MinGW! And what fun would that be if we left it there? Oh sure you can get files in and out of standard 8″ images, but can you run them? Over at the Takeda Toshiya’s page, not only does he make the MS-DOS player, and a whole host of other Japanese machine emulators, but he also has a CP/M player that works in the same style! So, combine the two, and now you too can trivially export and import files for emulators like SIMH, or just run files naively at the Win32/Win64 command line! 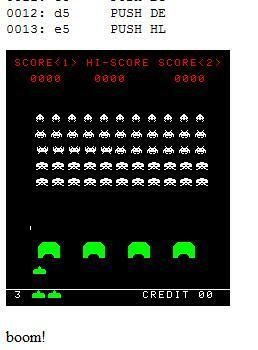 Ok starting with my shellinabox post, I’ve expanded to include SIMH’s Altair emulator! CP/M 2.2 in a box! Executing this is really simple! A small shell script will take care of the whole thing.  Of course I’m assuming dead processes get reaped. But check it out! I’ve put BASIC-80 rev 5.21 and ZORK I in there! Some advice on SIMH thought, you can execute a shell with the ! command (hitting Control-E will interrupt SIMH) so to prevent that alter the line in scp.c to make sure it’s a noop_cmd instead of spawn_cmd. Not that anyone was doing anything sneaky as the nobody user, but to prevent it. Additionally I guess I should do a 12 hour cronjob to kill displaced altairs. Welcome to my Altair 8800 Clone ! Be sure to check out the web page for a live picture of the machine in action! Author neozeedPosted on February 23, 2014 February 23, 2014 Categories 8080, CP/M, ZorkLeave a comment on telnettable Altair 8080 clone! Wow this was without a doubt one of the more confusing things I’ve ever done. So here is the problem. I want to delete some files from an IMD disk image, and then copy some new ones in. Easy right? .. maybe. Ok first up the easiest tool I’ve found to manipulate CP/M disk images is cpmtools. Even better their pre-compiled binary is for Win32, so I’ll run it with Wine on OS X. which works fine. Although there is one slight problem, cpmtools doesn’t read the IMD disk format. 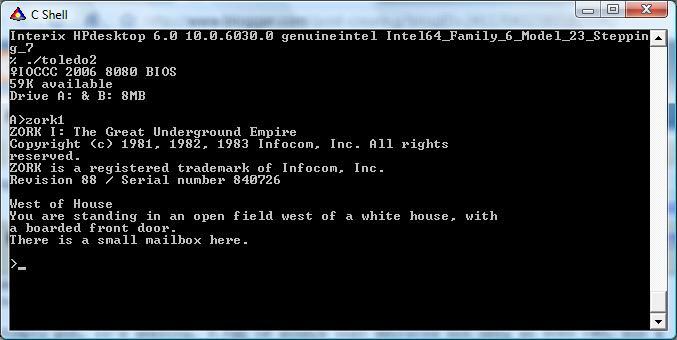 So you will have to download imd118.zip from a backup of the late author’s computer. And now I can look at the image file! And the best part is that it worked! 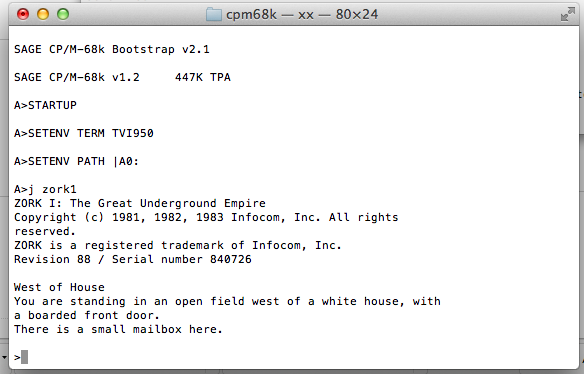 So now I was able to transfer over a binary version of com.68k, com2.68k, along with Zork, and fire it up! Unfortunately the interpreter doesn’t work right. It could be the disk transfers fault, maybe the SIMH SAGE emulator, or even the 8080 emulator. But it worked this far. 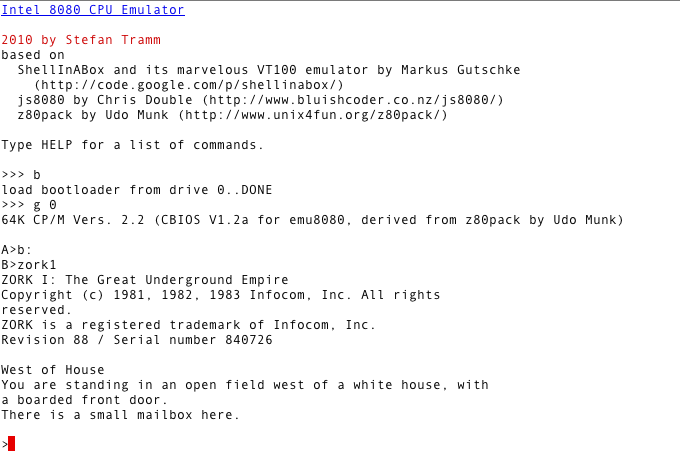 Well I found this program, Dioscuri quite interesting… It’s a PC emulator written in JAVA! 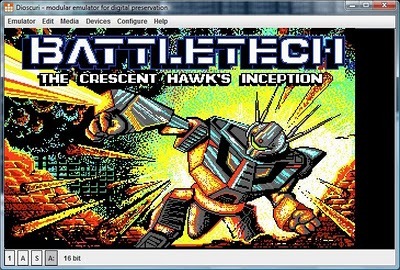 Maybe a later version will work, but for what it’s worth, here is the title screen from Battle Tech. The best game of 1988! Naturally, any machine with a good JVM ought to be able to run this… But I’ve always found Java to be such a moving target…. Complete with i8080 emulator in Javascirpt! This is some really neat stuff (to me) anyways. While googling around on various i8080 CPU emulators, I came across this post, from the 19th IOCCC. Best of Show winner, Óscar Toledo. Simply put, it’s amazing, 3.5kb of source that emulates not only an 8080 CPU, but a basic environment capable of running CP/M. I’ve found it runs great with either the SUA/SFU environment for Windows, and Linux x86. Toledo2 running on Vista’s SUA Unix emulation. Anyways it doesn’t work on the Sparc QEMU thing, nor my m68k NeXT cube… But hell it’s amazing to watch this thing in action. If you have the right setup you should check it out! Also today, a copy of Zork 1 for CP/M on 8″ diskette arrived! I’ll have to take some photos of it later. Author neozeedPosted on June 17, 2010 April 3, 2018 Categories 8080, CP/M5 Comments on Toledo 8080 emulator!